Fobus Glock 31 Tactical Speed Left Hand Holster - EM17 | 2018 Price! The Fobus Glock 31 Tactical Speed Left Hand Holster “EM17” is made out of a mold injected Nylon formula and a leather safety strap giving it high strength and flexibility. The Holster has a passive retention leather strap and polymer that acts like a spring on the trigger guard area and holds the handgun firmly in place until released by the operator. The Fobus Tactical speed left hand holster for Glock 31 (“EM/RBT”) allows you to carry a tactical flashlight, a laser pointer or any other accessory on you, all the time without compromising the user’s comfort or holster concealment thanks to it’s unique and simple design. Fobus long experience make their holsters highly recommended and highly rated for any use, if it’s for daily concealed carry all the way to tactical law enforcement use. High Density Polymers (Not Kydex). Lightweight (Approximately 140 gr / 5 oz). 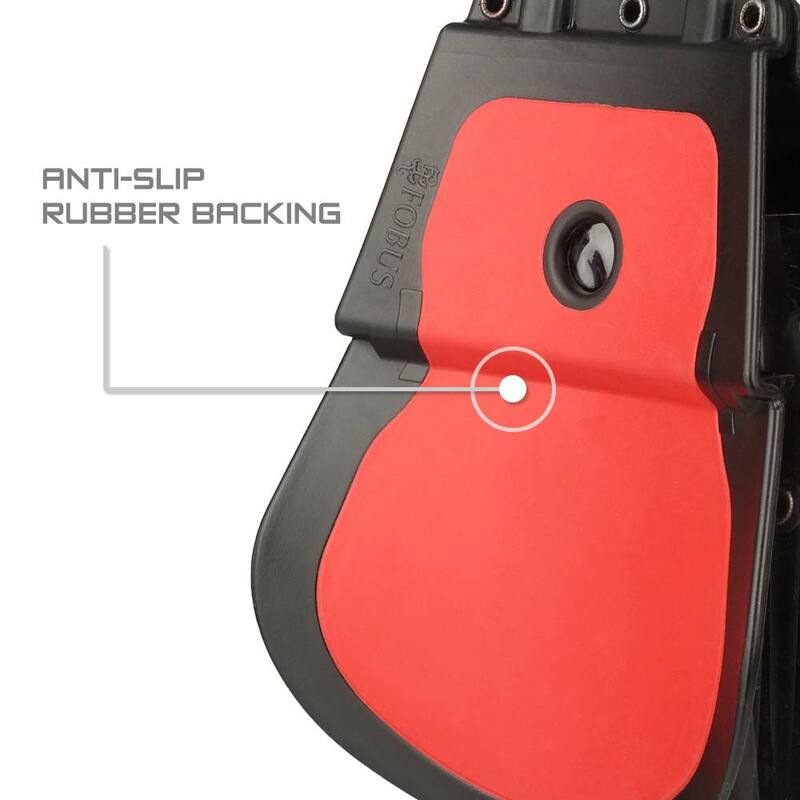 Rubberized Backing for Better Grip on Body. *Check out our single magazine pouch collection. Also see Fobus Durability Test Video. The Roto(RT) mechanism upgrades your holster and allows it to rotate 360 degrees so you can easily adjust to your comfort for any carrying situation such as: cross-draw, bodyguard, driver, etc..
*When choosing the “Roto(RT)” option you can choose different kind of carrying styles such as: Paddle, Belt, Duty Belt(Wide Belt), MOLLE, Thigh Rig – Drop Leg Extension & Shoulder Rig. **The “Roto(RT)” option adds about ~25gr/0.9oz to the holster’s weight and about ~1.2cm/0.5″” to the width. Place the holster on your hip and make sure the paddle is pushed all the way down on your belt. To holster the weapon insert the barrel first and then snap the gun into place. ***All dimensions mentioned refer to the holster’s body(without attachments).